The landmine might be the best piece of equipment you've never used. Brush the dust off this beast and prepare for battle with these three exercises! Landmines aren't only found on battlefields. They're now scattered across some of the top training centers in the world. Of course, I'm not talking about explosives. I'm talking about a barbell that's been shoved into a corner or sleeved in a fancy attachment anchored to the ground, then weighted on the opposite end. That's a landmine. It's easy to set up, and it's an extremely effective training tool. 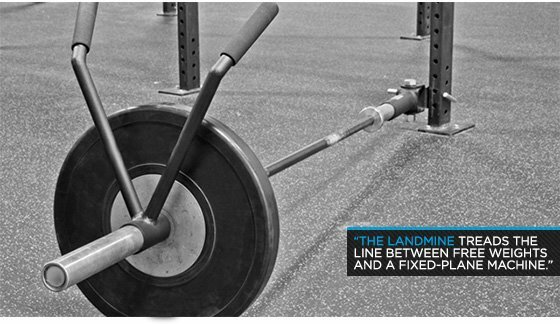 The landmine treads the line between free weights and a fixed-plane machine. It allows freedom to move outside pre-set action lines, but not enough that you lose control or overload the weight. Having one end fixed to the floor provides more of an arching movement versus a linear movement, which is beneficial for training shoulders, hips, and trunk muscles. The landmine also provides a great way to vary your workouts and provide serious overload and stimulation for the target movement. It helps you avoid potentially painful ranges of motion. You get stronger and hurt less, which is a serious win-win in the training universe. For example, the landmine overhead press allows you to position the bar slightly in front of your head, which reduces stress on the shoulder joint but still taxes the deltoids and traps to a high degree. Simply substituting landmine presses for dumbbell presses can make cranky shoulders strong without pain. The position of the bar matters. Because the bar is partially supported on the ground, you will lift less than the entire amount of weight of the system (i.e., the bar and plates). The amount of weight you lift relative to the amount on the bar is reduced as you raise it to a higher angle because more weight shifts to the end supported on the ground. The closer the bar is to the floor, the more weight you will lift. A kneeling overhead press is actually harder than a standing press at the same weight. Because the bar moves in a curved path, you have to get used to moving outside a linear path. Most people progress through an exercise from point A to point B in a direct line, but a landmine uses curved pathways. This requires some acclimation. 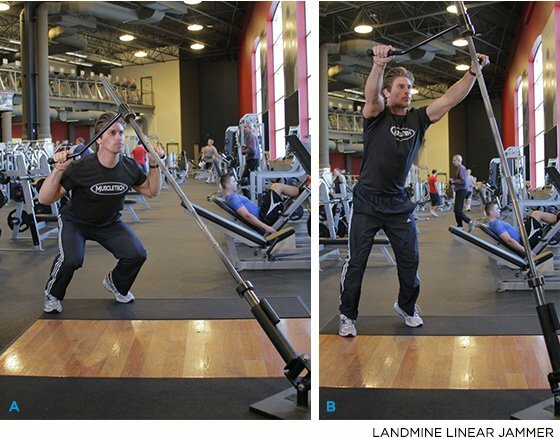 Here are three landmine exercises to get you started on the path to mass construction! Grab the handle right beneath the weight collar, take a split stance with your feet roughly twice as wide as your shoulders, and place the same leg as the working arm in the back position. Bend from the waist and make sure your back stays tensed and even slightly extended. Squeeze your lat, pull the weight up, and make sure your shoulder blade glides back and down. This move works nearly every muscle on one side of your body at a time, but specifically hits the glutes, deltoids, and quads. Start by grabbing the end of the weight collar and stand so the bar comes across your body. Hold the bar like you're preparing to throw an uppercut. For instance, if you hold it in your right hand, the bar will be supported on the floor on your left side. With a shoulder-width stance, begin by squatting down with your feet flat on the floor. Find a position where the weight isn't pushing you over or causing you to lose balance. From the squat position, press back up while simultaneously rotating on your feet to face the base of the landmine. You should end in a split-stance position. Press the weight overhead with the arm holding the bar and squeeze your core and the glute of your back leg hard. Lower the weight, pivot back to a square stance, and then return to the bottom of the squat again. Stand facing the landmine and grab the collar in both hands with a baseball grip—one hand stacked above the other like you're holding a baseball bat. Take a stance wider than shoulder width and press the weight overhead. Keep your arms straight, turn your shoulders, and pivot your feet so the weight moves to the side. Lower into a lunge and bring the weight down to the knee in a smooth and controlled manner. Press back up through the legs and swing the weight back to the top of the movement. Try to keep your arms taut and elbows nearly locked. Repeat on the other side. These are just three simple ways to integrate a landmine in your training, but it doesn't stop here. There are thousands of ways to improvise and alter common exercises to enhance stimulation that leads to muscle growth and definition. When in doubt, try a new landmine exercise with light weight and see how you feel!